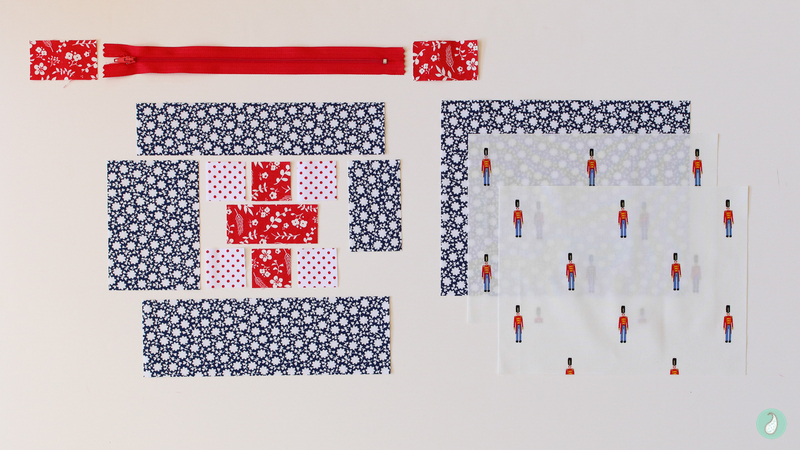 As a quilter, there are endless pieces of scrap fabric on my cutting table at any one time. 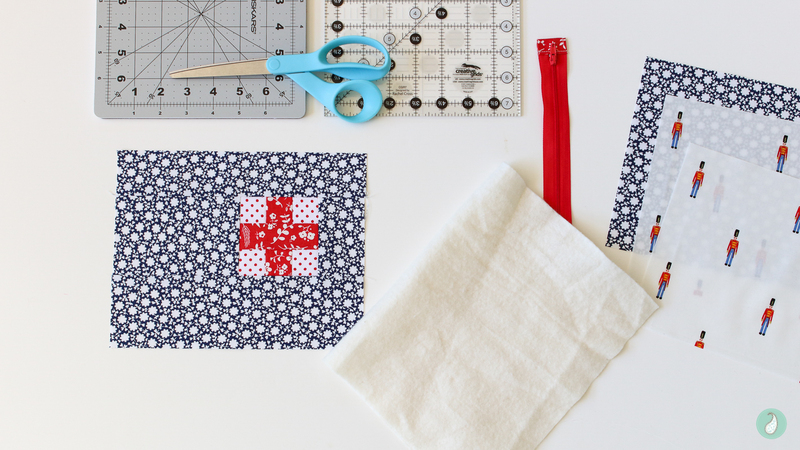 These little pieces are often perfect for making a pouch or two! 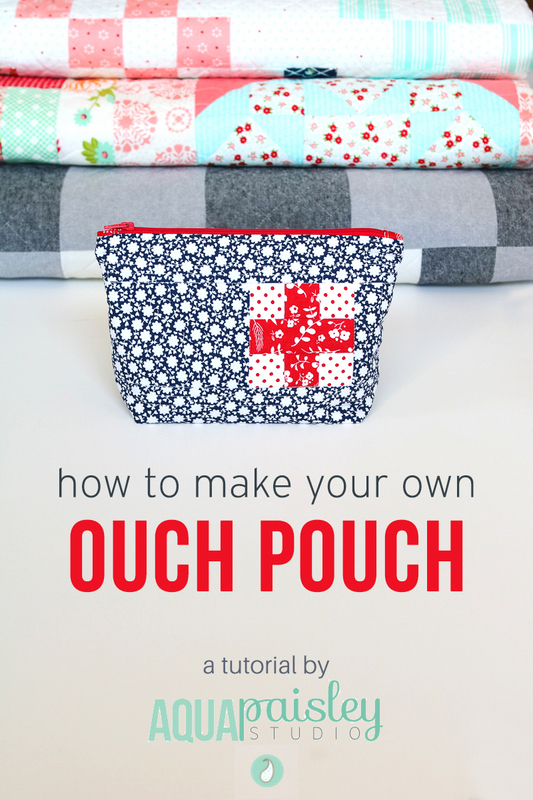 Today, I am sharing the instructions for how to make what I am lovingly referring to as an ‘ouch pouch’ – but once you understand the basic method, you can easily adapt these instructions to make any size pouch you require. I made a couple of these pouches last Christmas after being inspired by a similar one Susan @thefeltedpear shared on IG. I played around with the proportions until I was happy with the size and shape, and scribbled down all my notes in my pattern drafting notebook. 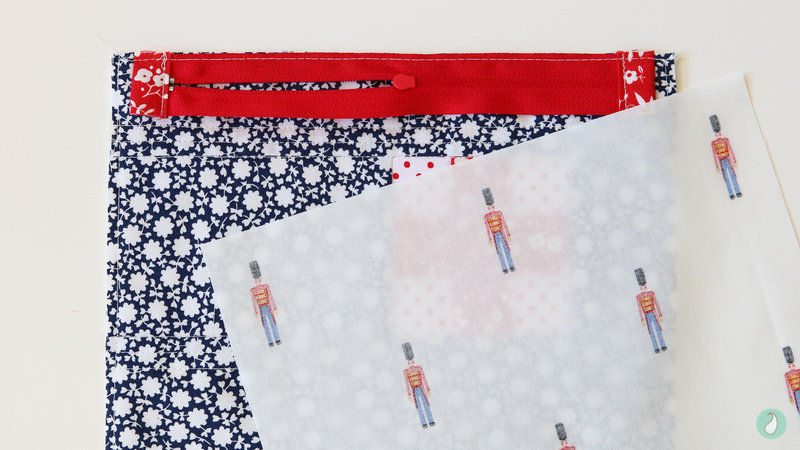 This year, when I decided to make a couple for my nieces I went straight to my notes and got to work – everything is so much easier when the hard work has already been done for you, so I thought I would share my process here, on the blog, so you can make some pouches in time for the holidays too :). 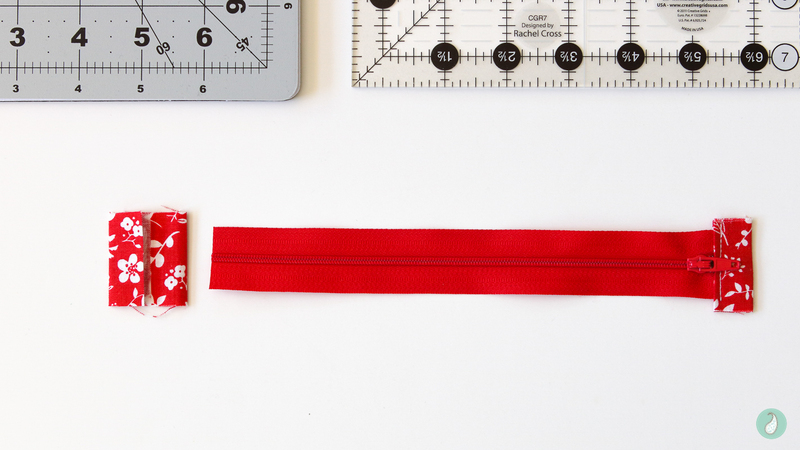 Red Fabric – (2) 1-1/2″ squares, (1) 3-1/2″ x 1-1/2″ unit, (2) 2-1/2″ x 1-1/2″ units for zipper tabs. 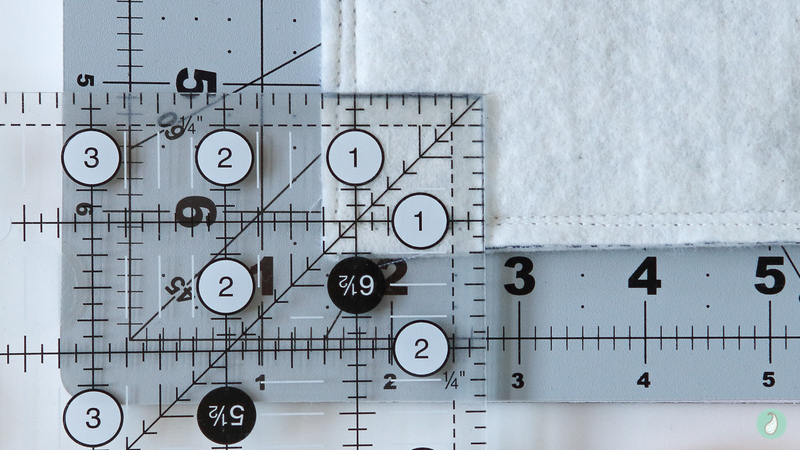 White Dot Fabric – (4) 1-1/2″ squares. Navy Exterior Fabric – (1) 2″ x 3-1/2″ unit, (1) 5″ x 3-1/2″ unit, (1) 9-1/2″ x 2″ unit, (1) 9-1/2″ x 3″ unit, (1) 9-1/2″ x 7-1/2″ unit. 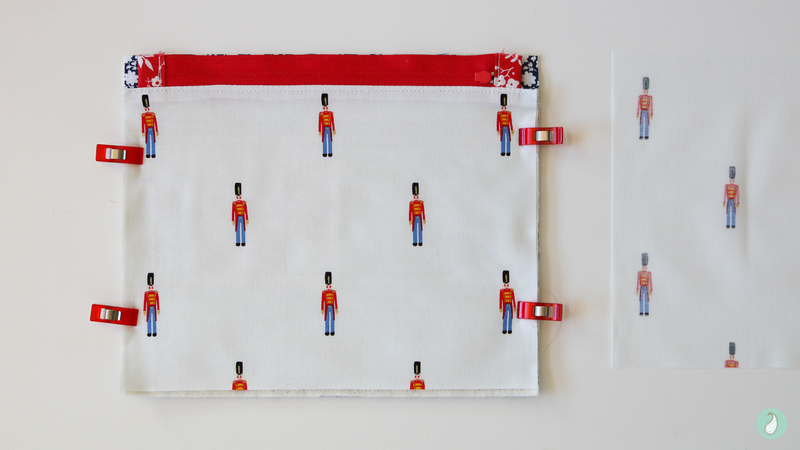 Lining Fabric – (2) 9-1/2″ x 7-1/4″ units. 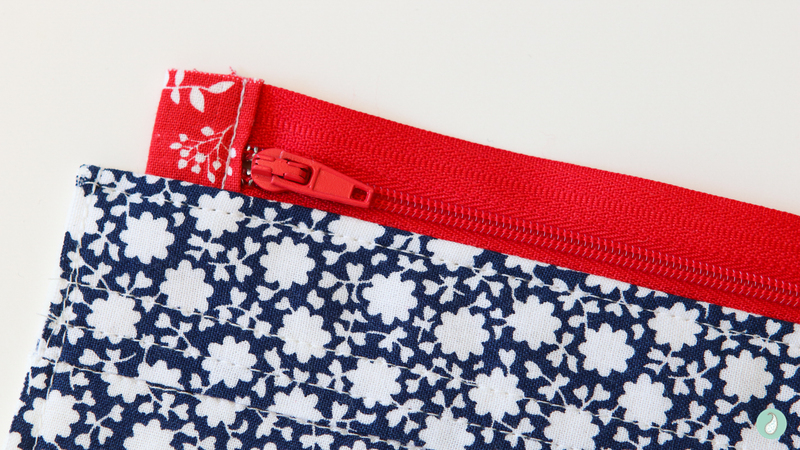 Fold the zipper tab in half widthwise with wrong sides together. Press. Unfold and then fold each short end in to the centre crease as shown. Fold in half again. Press. Make 2. Starting with the end beginning with the zipper pull, trim the ends of the zipper tape so each side extends 1/2″ beyond the metal teeth stops. Place the zipper end sandwiched between the tab as shown. 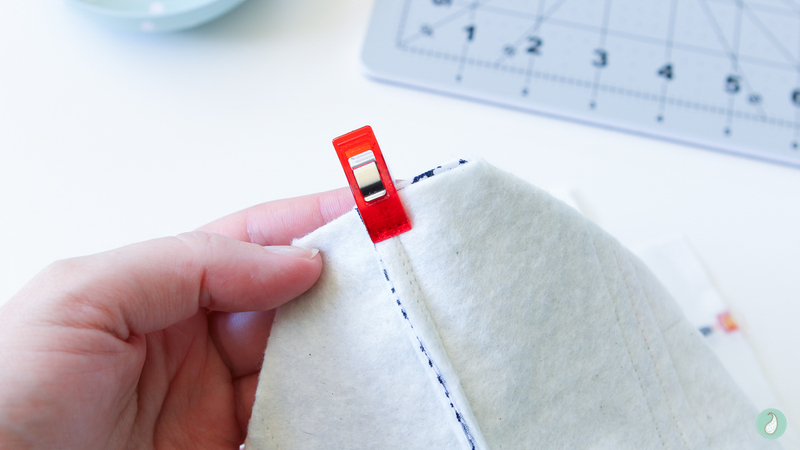 Ensure the metal stops are on the outer edge of the zipper tab so they don’t interfere with your sewing needle when it comes time to stitch. Secure the tape in place, either with pins or some washable glue. I like to use the glue, because it’s quick and easy. 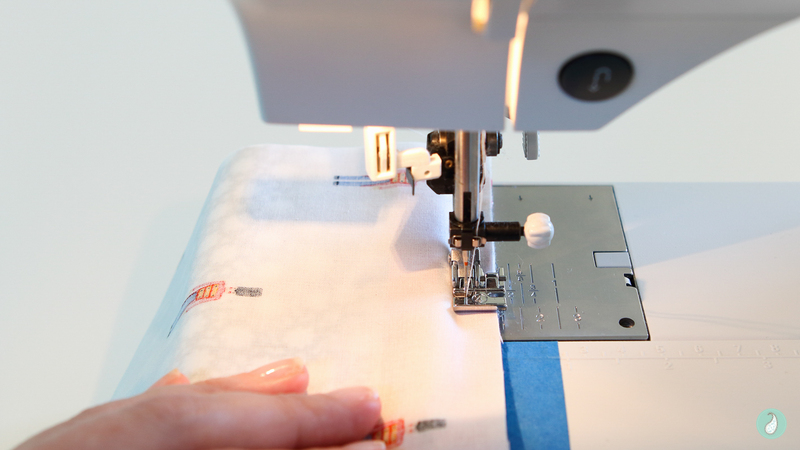 Using the zipper foot on your sewing machine, topstitch a straight line across the zipper end tab. 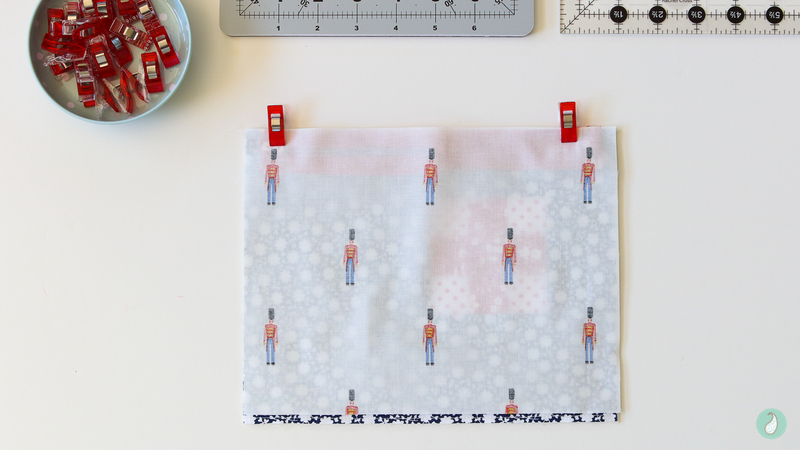 I will often create two parallel lines approximately 1/8″ apart, or stitch straight over my first line of topstitching for some added strength at this point. Next, you will repeat the same process on the other end of the zipper tape. 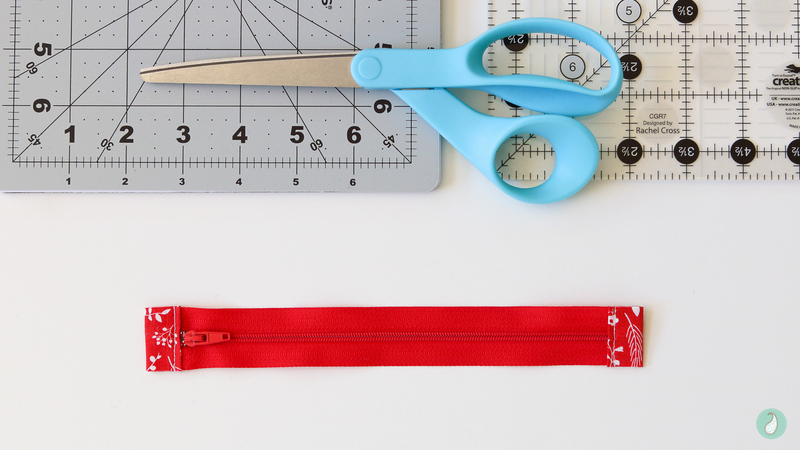 But first, you must trim the zipper to the size required – in this case, our overall zipper length is to be 8-3/4″ long from each zipper tab end. 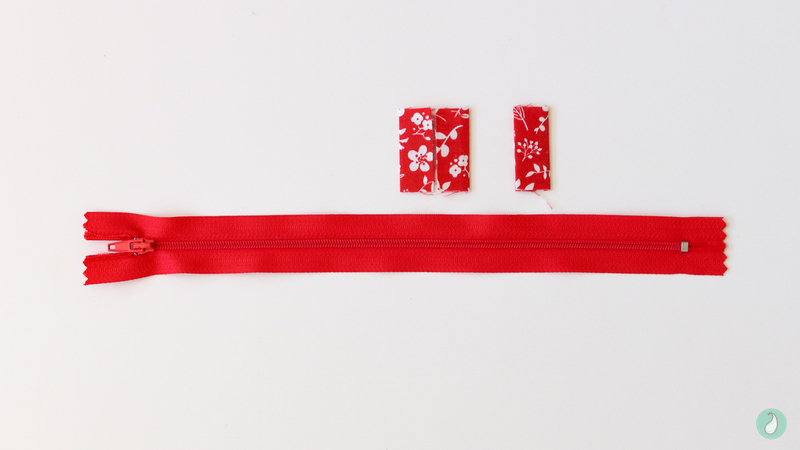 After you have topstitched the second tab, trim the ends of the tabs in line with the zipper tape. 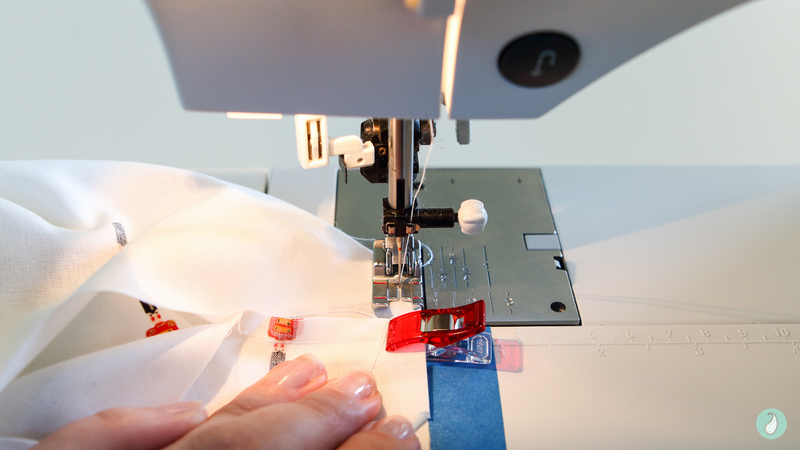 NOTE: This method is suited to plastic zipper types which can easily be trimmed and stitched through . Metal zippers can not be so easily manipulated, and therefore it is best to determine the pouch size based on the size of the metal zipper. 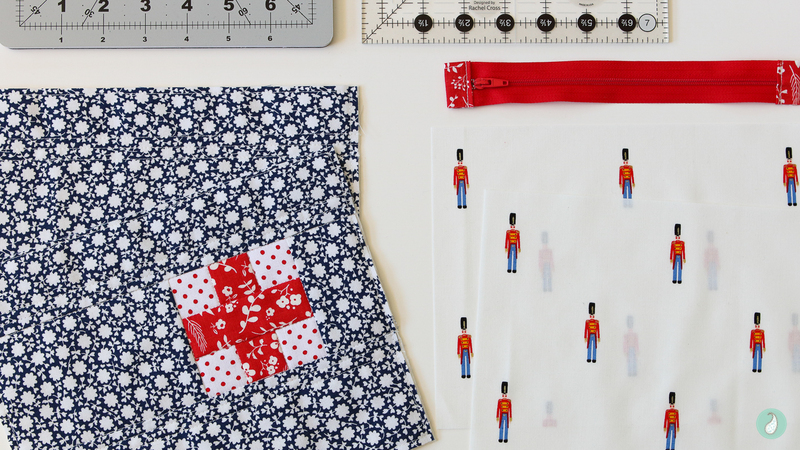 Using a 1/4″ seam allowance, sew together the red and white units to create the red cross. 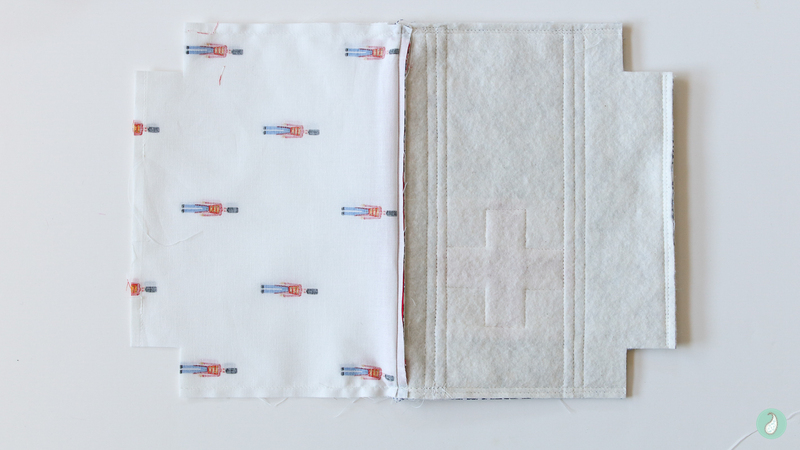 Then sew the side panels, followed by the top and bottom units as shown below. 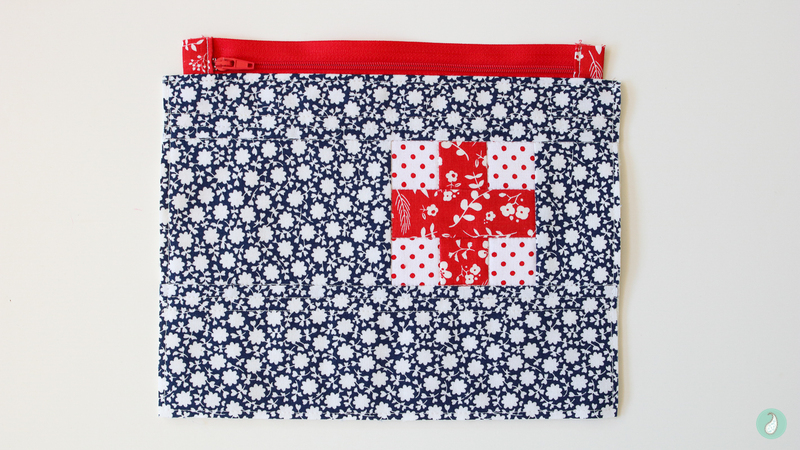 You should now have a pieced pouch front 9-1/2″ x 7-1/2″. Choose either batting or interfacing to give body and strength to your pouch. In this instance I have chosen to use a lightweight cotton batting (simply because it was sitting as a leftover piece on my cutting table). Most commonly I use leftover pieces of my wool/poly blend batting and I think the extra loft and resilience gives a more structured feel to a pouch, and allows it to stand on its own a little better. Experiment with different types of batting to determine what works best for you! Use either pins or basting spray to secure the front and back exterior pieces to the batting. Quilt as desired. Trim the front and back exterior panels. Place the front pouch exterior piece right side up. Centre the zipper, teeth side down with zipper pull to the left, aligning the top edges. Baste zipper in place. Place the lining piece wrong side up on top of the piece just sewn. Pin, glue or use clips to secure the lining in place. 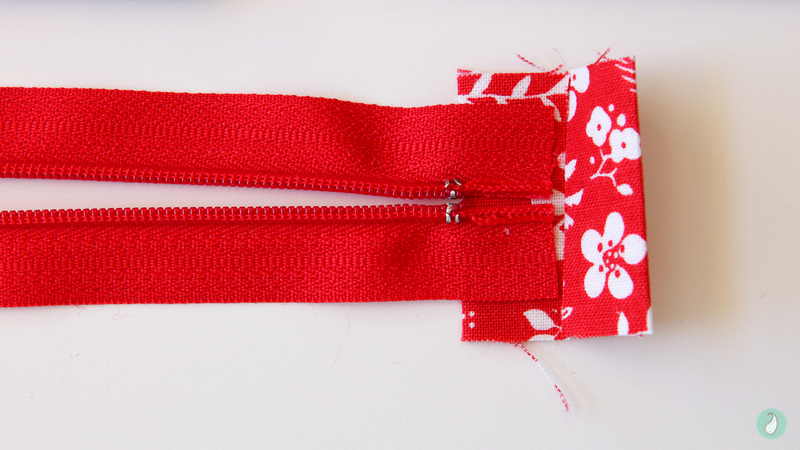 Using a zipper foot as a guide along the zipper teeth edge, sew together the zipper sandwich. Note: As you can see in the image below, I don’t move my needle closer to the zipper teeth, which is an option. I like to see the accent colour of the zipper tape and find not having to move my needle more helpful when switching between feet. 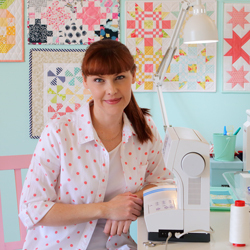 However, all sewing machines differ in the type of zipper foot they have and the finish they provide, so don’t hesitate to experiment with this step to see what works best for you. Press pieces away from the zipper. Be careful not to place heat directly on the zipper teeth as this may cause the teeth to warp ever so slightly, making the zip difficult to slide. Topstitch approximately 1/8″ from edge. Place the remaining back pouch exterior piece right side up. Centre the zipper (with front exterior/lining now attached), teeth side down with zipper pull to the right this time, aligning the top edges. Baste zipper in place. Repeat the same process as described earlier to complete the second side of the zipper. NOTE: Before proceeding any further, open the zipper at least half way. If you don’t do this now, you won’t be able to turn your pouch inside out to complete it ;). Place exterior pieces and lining pieces right sides together. 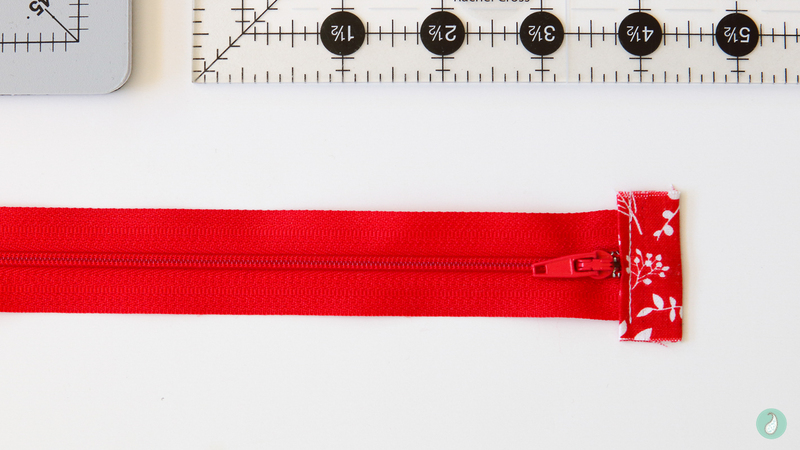 The zipper tabs are bent towards the lining, and the seam allowance from the zipper tape is directed toward the exterior pieces. 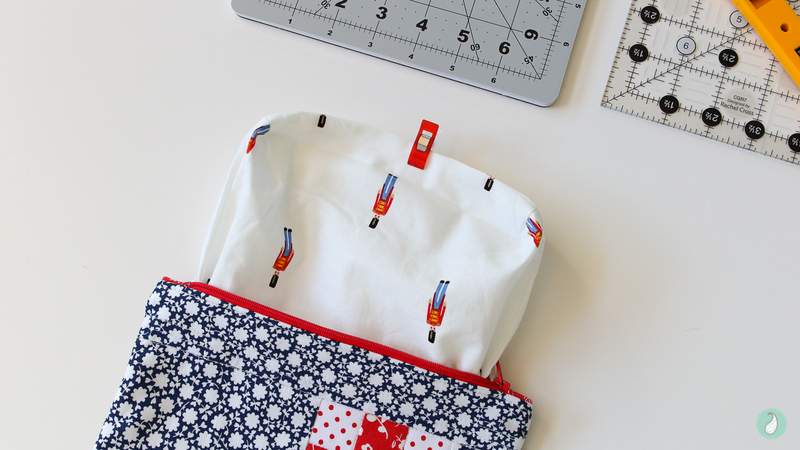 Starting approximately where the lower red clip is on the bottom edge of the lining, sew around the entire pouch using a 1/4″ seam allowance, finishing 3″ before you reach the beginning of your stitching to create an opening in the lining for turning. It’s helpful to backstitch when you start and when you stop stitching to reinforce these points. 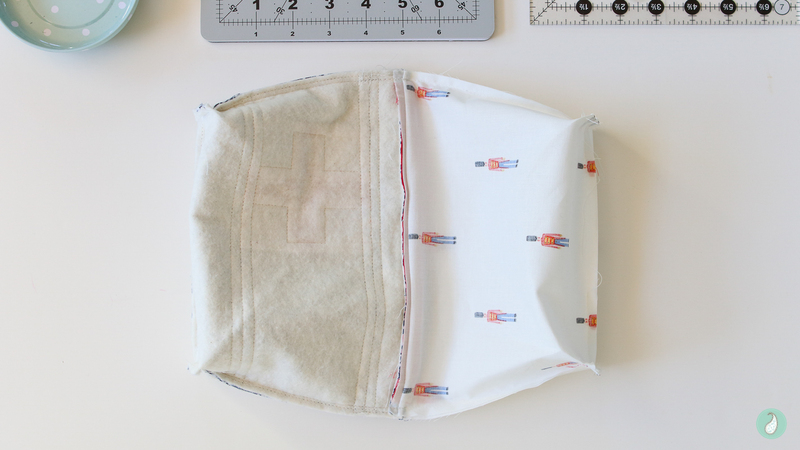 While this seems like it should be a fairly easy step, the transition between the bulk created on the exterior side and that of the lining can be difficult for some sewing machines to handle. You may find a walking foot to be helpful. 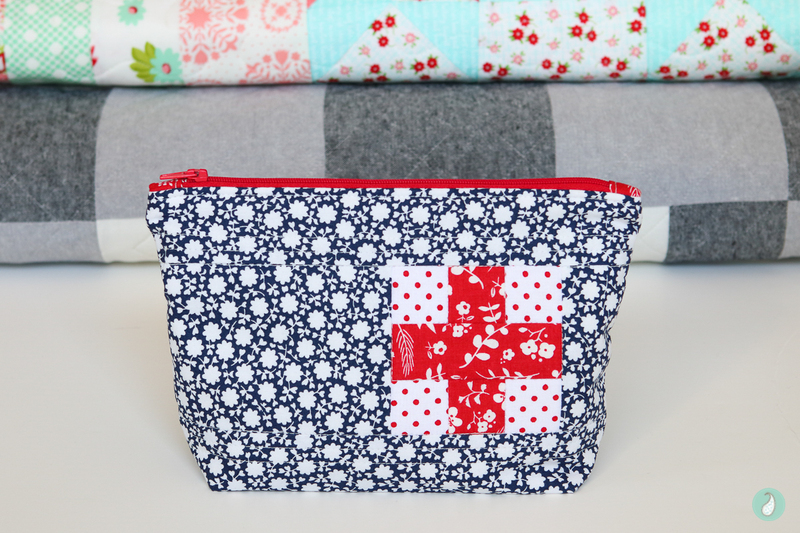 Alternatively you can stitch the sides starting at the bulky centre around the zipper and only stitch down the side, then flip the piece so you can stitch the second side also starting from the bulky centre. Then stitch along the bottom separately. You would then do the same thing for the lining side. 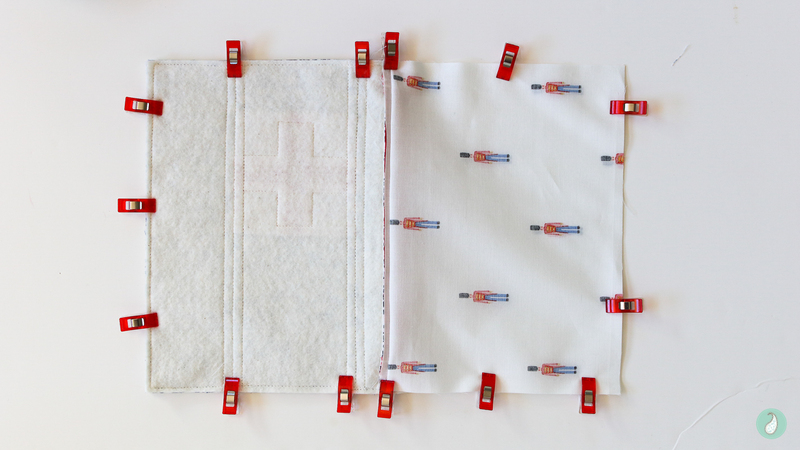 In order to create a boxed bottom, trim 1-1/4″ squares from each of the four corners of the pouch. 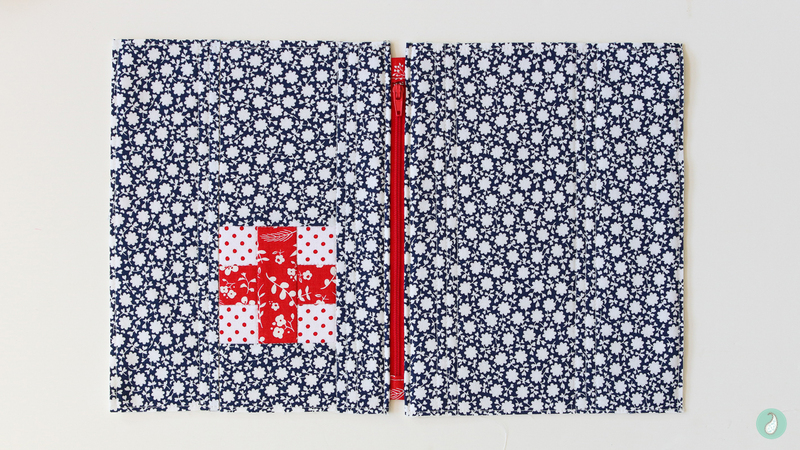 Pinch the boxed bottom together by aligning the bottom and side seams. Finger press seams in opposite directions. Pin or clip in place. 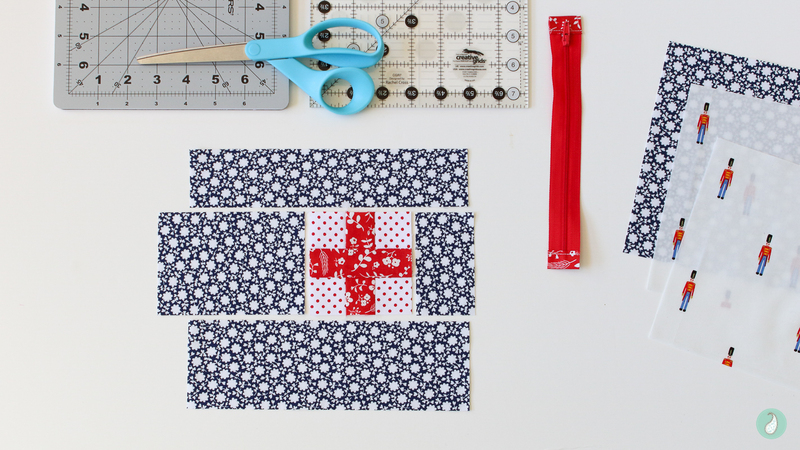 Back stitching at the beginning and end, use a 1-/4″ seam allowance to stitch along the edge you just created. Box each of the four corners. 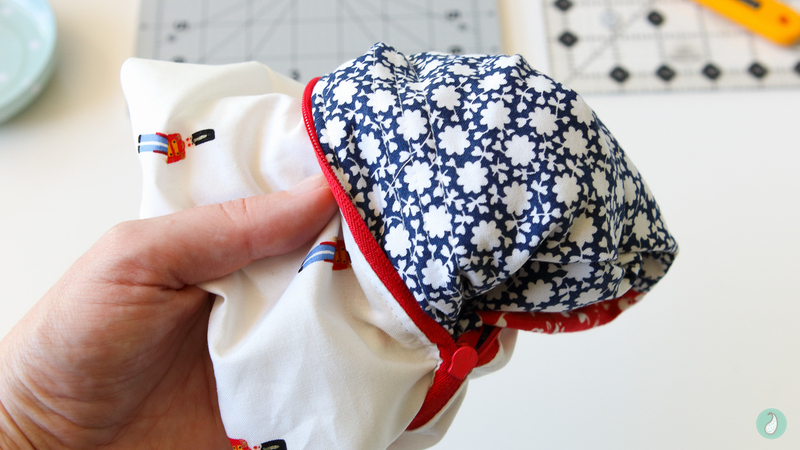 Place your hand into the opening you left in the lining and turn the pouch right side out. Machine or hand stitch the opening in the lining closed. 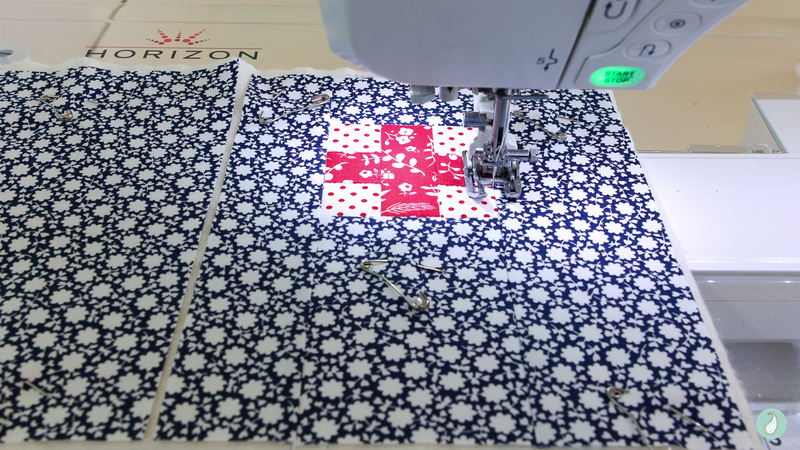 I like to press the seam allowance under to give me a nice easy press line to use as a guide when hand stitching. You can use either a ladder stitch or slip stitch if you prefer. 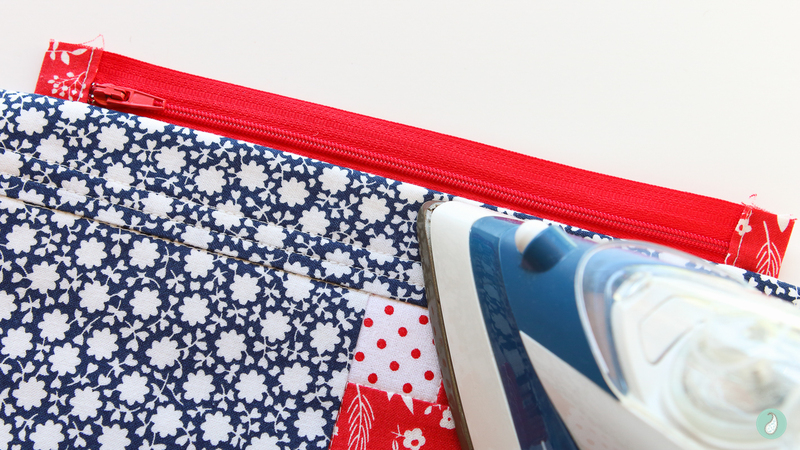 Place the lining in the pouch and give it a final press if required. Smile, you have made your own pouch – and it really wasn’t too difficult, was it? 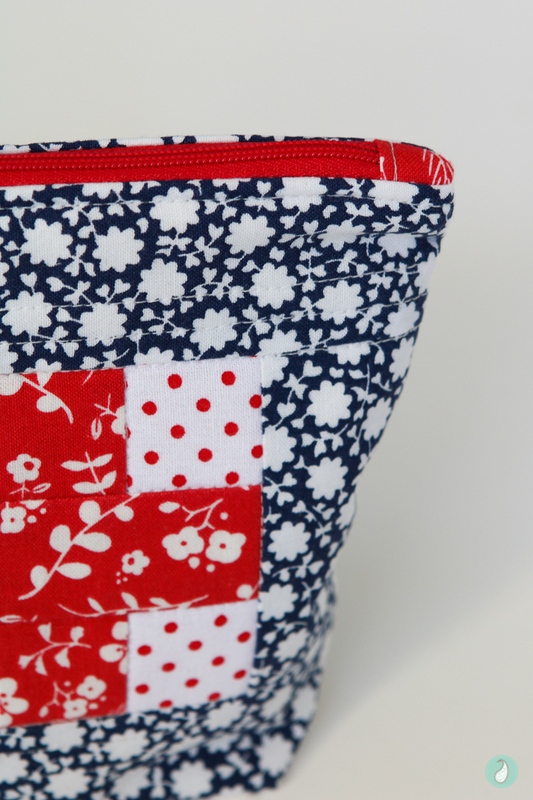 Once you have mastered the art of the basic pouch, your design options will be endless. 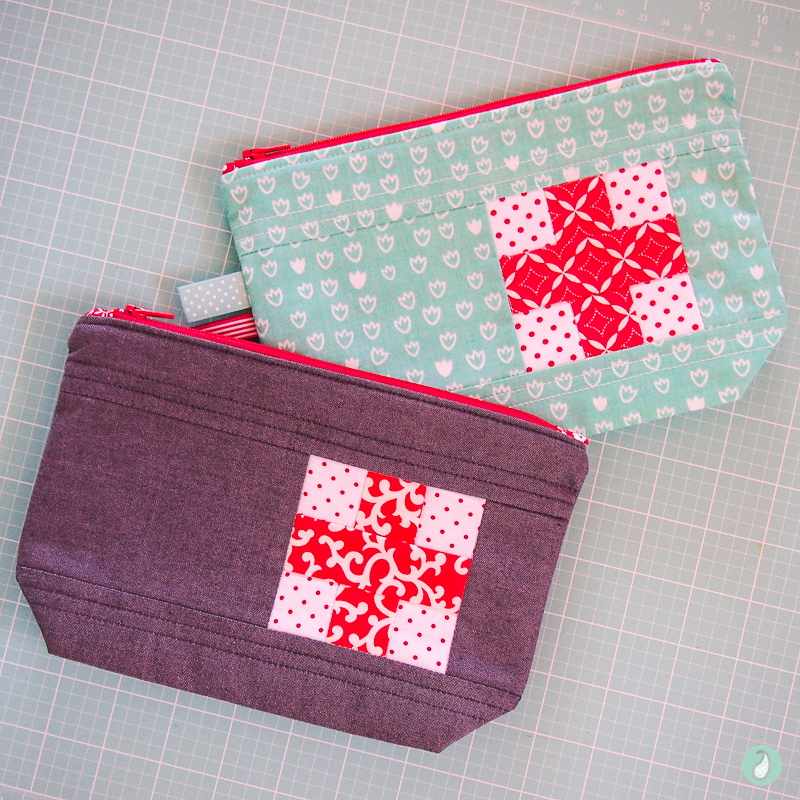 Here are the first two Ouch Pouches I made in 2016 :). 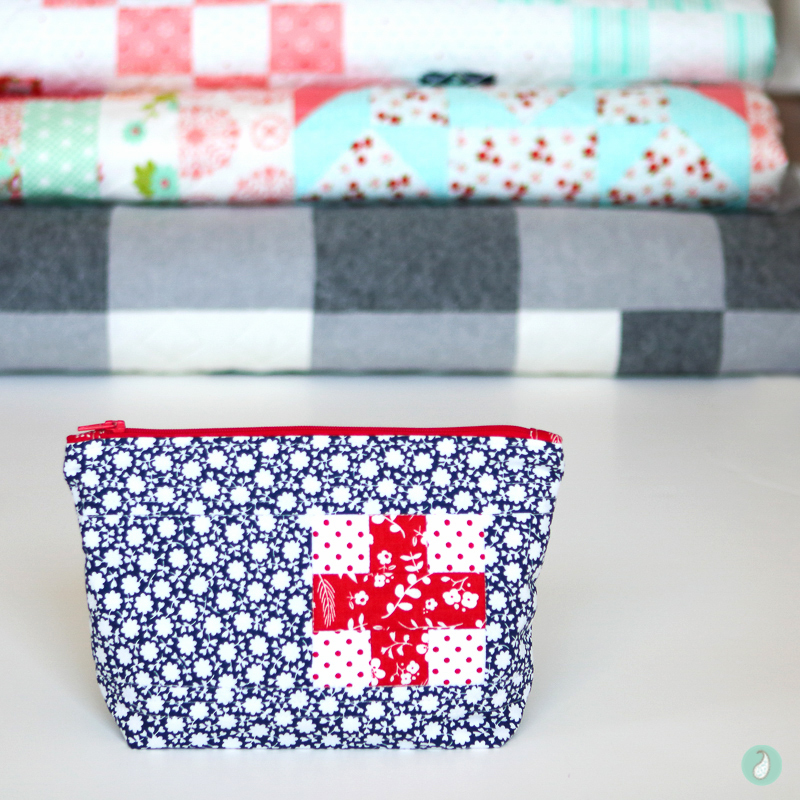 I hope you enjoy this tutorial, and it helps you on your own pouch making journey :). If you found it in any way useful, and have a Pinterest account, please pin the image below to help other makers find this content. If you have any questions, don’t hesitate to ask – I will get back to you as soon as I can. Merry Christmas! I hope you all have a joyful and safe holiday with your loved ones this year. How perfect is this! 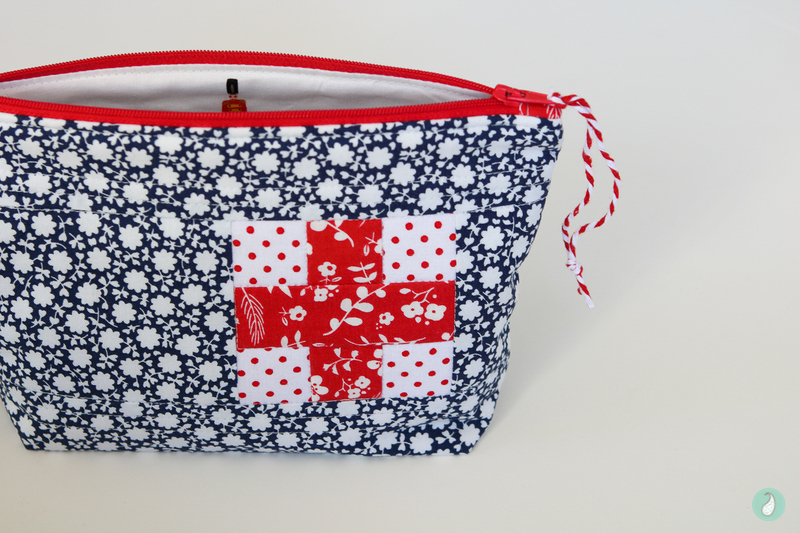 I wanted to make a zippy pouch for my hand therapist, to put all her tapes and scissors in. The red cross on the outside is ideal! Thanks Susan – sounds perfect to me ;).